“Our family woodland has provided income and tranquility for my family for six generations. Some of my best memories of childhood are walking the woods with my father. He made sure I loved the land. I have passed that on to my children and am working on my grandchildren now. I love walking through the woods with my two-year-old grandson telling him the names of everything and watching him pat the trees. No one loves their land more than the person fortunate enough to own their own woodland. Most of us want to hand our land on to the next generation in better shape than we got it. We are stewards of the land and everything on it to make sure that it’s here for our unborn grandchildren. We are the keepers of the ecosystem created by the land we own. Hear Jo Pierce talk about his challenges to keep his land in an "Earth and Sky" interview. 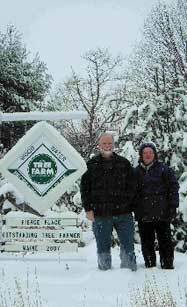 Jo and Kathy Pierce of Cumberland County, Maine were named the 2007 National Outstanding Tree Farmers of the Year. They are the sixth generation of his family to reside on the family property and are considered champions of forest management and conservation. Their 2,000 acres of woodland was placed under a written forest management plan and became a certified Tree Farm in 1961. Certified Tree Farmers own at least 10 acres of forestland and actively follow a forest management plan developed in partnership with an American Tree Farm System (ATFS) volunteer forester. The plan addresses forest sustainability, wildlife habitat, recreation and water and soil conservation. Beyond forestry management, the Pierce family is dedicated to wildlife conservation. As partners with the Maine Fish and Wildlife Department, they have successfully relocated wild turkeys in an effort to reinvigorate the bird population in Maine. Additionally, their land is home to deer, bats, barn swallows, red-tailed hawks, moose and bobcats. A black bear has made a den in a pile of rocks at the 100-year-old former railroad construction sight. As part of their wildlife conservation efforts, Jo was appointed to the Northern Cottontail Group, which considered whether to place the rabbits on the endangered species list for protection against extinction. Furthermore, a wild island on the Saco River on the Pierce Tree Farm property has been reserved for canoeists and campers to enjoy the splendors of the Maine wilderness. Active members of numerous conservation and community organizations, Jo and Kathy Pierce are members of the Maine State Tree Farm Committee, the Small Woodland Owners Association of Maine, the Southern Maine Maple Sugar Makers, the Maine Grange and the Maine Historical Society (since 1978). Jo’s commitment to forestry advocacy and outreach led to his appointment to the Maine Governor’s Task Force on Certification, the Baldwin Planning Board and the Governor’s Task Force on Public Use of Private Land.